Sometimes ‘Auburn Family’ just makes sense. Sometimes, no matter what journalism school or conventional writing etiquette tells you, you just have to come out and say it. Sometimes there isn’t any other way to describe it. The Auburn Family rolled the trees at Toomer’s Corner for the final time this weekend, as tens of thousands gathered Saturday to bid the legendary oaks one last goodbye as part of this year’s A-Day festivities. A record-breaking crowd of 83,401 showed up at Jordan-Hare Stadium to witness the unofficial debut of Gus Malzahn’s new-look Tigers in the annual spring game, sending officials into a frenzy at the stadium gates and concession stands amidst the unexpected turnout. Then most of those fans, if not all of them, if not more of them, headed to Toomer’s Corner to send off the oaks with the tradition’s biggest rolling ever. It was a celebration marked by thousands of beaming eyes and unbridled smiles. It was a joyous affair, honoring the end of an era, the beginning of another, and the collective spirit enduring it all. And there was toilet paper. Hundreds and hundreds of rolls of toilet paper, turning the two green-less, wounded oaks into towering white wonders. It draped over street signs and sprawled over trees up College and down Magnolia, and found itself everywhere green in between. On the ground it was up to your ankles, sometimes to your knees, and above you it dangled, just over your head. It was everywhere you looked, and as far as you could see. It was enough to cover all of downtown. Today, most of that paper has been removed, and crews are working to bring down the trees. So ends a chapter in the story of one of college football’s greatest traditions. And while the images from the corner may seem bleak today and in the days to come, Saturday is the day that will live on in digital archives and through local historians. The story that will be told is a story of resilience, and a fighting spirit. This all came about through an infamous act of malice, and yet you wouldn’t have known it if you stood on that corner, between those trees, celebrating on that bright and sunny Saturday. You don’t have to be an Auburn fan or a fan of sports at all to appreciate that. It is why this thing we call sport is the greatest, most unifying thing in the world. Saturday was just a small example of how people can face adversity, and overcome obstacles, together. It’s not just about the thrill of victory or the agony of defeat, but also the swelling pride of overcoming and moving forward. It’s a microcosm of our world, and every day it breeds hope that all people can get through anything, together, on the same team. On Saturday, that Auburn Family proved that it won’t miss a beat, and that Tiger fans will be rolling oaks at that street corner for as long the university stands. All week, everyone has been careful to say that Saturday was the advertised ‘Final Rolling’ of the oaks, not the corner, because this tradition will live on. And while some Auburn people are concerned, thinking it may never be the same, I’d bet my ridiculous tuition that Saturday just raised the bar for the next time fans take that victorious, evening walk from Jordan-Hare to Toomer’s Corner. 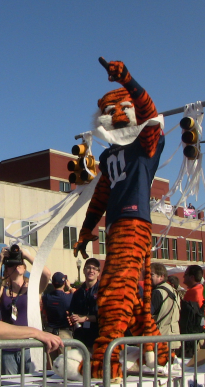 Perhaps that’s the best part of all this — that Auburn fans will roll Toomer’s again, and that Auburn fans have rolled Toomer’s before. It’s never been quite like Saturday, of course. There certainly is never a stage or a band or 2,000 free rolls of paper. First Time Ever wasn’t quite like Saturday, and neither was the national championship. But, each time, after every Auburn win, it’s something like that. Fans gather together. They celebrate together. They overcome together. And to think, that ‘Final Rolling,’ the biggest and best one yet, that ultimate example of unity and one of the Auburn Family’s finest moments, all came from that act of malice after 28-27. So here’s to Harvey, the man that said he had just too much Bama in him. On Saturday, the Auburn Family showed just how much Auburn they had in them. I am swollen with pride, and you got my tears to flowing with this. Wonderfully done. This is the best piece of writing you’ve ever put together Justin. Well done and War Eagle! Justin Lee’s vision of the Auburn Family and it Spirit captures the long moment that was Saturday. But there is more. On Sunday morning Auburn people began to gather and mingle at The Corner. Cars moved slowly past the intersection, coming from all four directions. At times the traffic lines backed up over a block in all directions. The continued all day. Hundreds, perhaps a thousand or more were always there throughout the day and provided a great greeting to the Auburn Equestrian team when it arrived after winning the National Equestrian Championship the day before. The all-day Sunday gathering spoke even greater volumes regarding the Auburn Family because it wasn’t about football or even sports. It was a statement by all of the value of the education attained from the University, the value of the friendships among the Family, and the commitment of all to the true spirit of the Auburn Creed among all who consider themselves members of the Auburn Family. WAR EAGLE is not a football cheer, it is a Family Greeting and the Family remains strong and grows stronger daily, regardless of the outcome of a sporting event. I think this is one of the best articles you’ve ever written. Auburn has some of the most passionate fans in football and you showed that clearly through this. War Eagle! I’m an Alabama fan, but I was so sad to hear about the trees. It’s just senseless, wanton destruction. When the Nashville tornado hit out near The Hermitage several years ago, it knocked down many very old trees. The Hermitage Foundation used the wood to make beautiful writing pens and sold them in the gift shop. Perhaps the wood from the Toomer’s oaks could be used in a similar fashion, and the funds used for a scholarship, or to help with the upkeep of the corner. That way, the Auburn family could keep the memories of the oaks alive, and perhaps, help plant new ones. Hope Gus leads the Tigers to a good season this year. Roll Tide Roll, and War Eagle! What a beautiful tribute! I’m so proud to be a part of the Auburn family! I was fortunate enough to share this wonderful event with my Daughter and it was every thing you just described… and more. I’ve never been more proud to be part of the Auburn family than in this past year or so, and to see my 13 yr old daughter find her love of ALL things Auburn even in these darker times. It IS a new day at Auburn. War Eagle! Well said. As you so aptly put it, this is the end of a chapter – not the book. The ultimate irony is that in attempting to destroy the tradition, Updyke succeeded only in making it stronger and more special than ever. War Damn Eagle. Wow what a weekend! Kidd Blue was honored to be chosen for the celebration. I hope we provided what was needed. The band is an Auburn original, getting our start right there on Toomer’s Corner in 1985 (as the house band at Denaro’s). We saw a lot of old friends and truly enjoyed helping the faithful celebrate. It was the show of a lifetime!